Use SCR to adjust the motor power to change the speed phase regulation. Use transformer relay to control motor on or off. Using WT310E/333E is to measure the motor’s rated voltage, consumed power, and input current. Upper picture is the cleaner circuit with power control circuit. When a trigger pulse is added to gate of the SCR, the state is ON, the polarity of the input AC voltage becomes OFF. 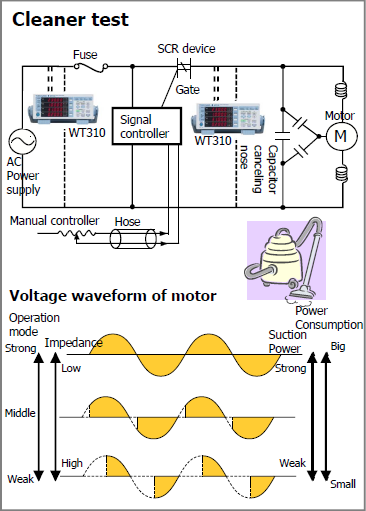 Thus, by changing the width of the gate pulse, it is possible to control the motor input current. Lower picture is the waveform of the motor input voltage. By the choice of hand control regulator stalls, the voltage waveform of the motor is changed. So that the motor speed changes and plays a role in adjusting the vacuum cleaner suction. By average processing to achieve high precision measurement of active power, voltage and current. The bandwidth can capture SCR waveform. For production line testing: GPIB (option), DA outputs (option).